As I press the button for the fourth floor in the lift at Jerwood Space I hear the voice of Patrick Stewart or, rather, Captain Picard of the Starship Enterprise: “Doors closing. Make it so.” That is weird, I think to myself, and hope there is not a camera in there to capture the stupefied look on my face. “Fourth floor: holodeck,” Picard then announces. But he is not finished. As I step out I hear, “Phasers on stun”. This idiosyncratic start is all rather fitting as I am on my way to meet Clayton Littlewood to talk about the play Dirty White Boy. There is something about Clayton that draws out the weird and the wonderful. It is what makes Dirty White Boy so compelling. It is the eve of the month-long run of Dirty White Boy at Trafalgar Studios and the third time I have interviewed Clayton. The play started out as a blog on MySpace, which then, because of its popularity, was published as a book. 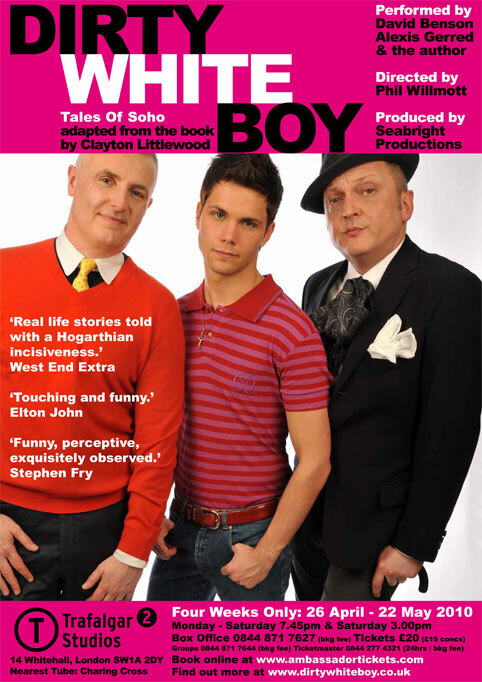 The book is about Clayton’s offbeat day-to-day life in the Soho shop Dirty White Boy. The first version of the play ran to packed houses for three nights in July 2009. The 2010 version has been expanded. As before, Clayton plays himself and David Benson the many characters that walk the Soho stage. The addition to the cast is twenty-year old Alexis Gerred, who was a runner-up in the 2010 ‘Eurovision: Your Country Needs You’. It is typical that, now I am in Clayton World, I hear that the original director, Phil Wilmott, could not make it to rehearsals because he was stuck in New York due to the plume of volcanic ash that had disrupted transatlantic flights. In his place is Katherine Hare. It is with Kat, Clayton, David, and Jorge, Clayton’s partner (as well as the play’s stylist), that I head down to have lunch and talk about the production. On the words “where you’ve gone wrong”, Kat begins to chuckle. David raises his chin, and responds, “I still get … offers.” Alexis sits back watching, relaxed, and very much the embodiment of Clayton’s description. “I think it’s more fully realised than before,” David begins, leaning in toward the voice-recorder on the table to ensure that his words are clearly heard. “Last year it was more what you could call a work-in-progress. It has far more in terms of …”Here he pauses, takes a deep breath, and on the out says, “layers, and …” Another deep breath is then followed by the word “nuance.” Then it is business as usual as he concludes, “And all the stuff you want that keeps an audience hooked and captivated.” The timing is magnificent. David is very much an actor’s actor, I cannot help but think to myself as he is speaking. He is marvellously aware of how a phrase can communicate his meaning and the same time sound rather ‘luvvie’ to the average Joe. He plays up to this by lifting his chin and pronouncing these phrases in a knowing manner. I have seen David on stage twice before, once in his one-man play Think No Evil of Us: My Life With Kenneth Williams, and again as Noel Coward in David Benson sings Noel Coward. He is a joy to watch and just right for the range of characters in Dirty White Boy. “It’s not a gay play,” Clayton insists at this point, which I think is exactly right. “It’s a social play,” Kat confirms “It’s a commentary on a certain time and a certain place.” Now we’ve really hit on something, and everyone becomes more animated as a result. Clayton and I had talked about the book crossing over from the ghetto of the gay and lesbian booklist when last we spoke, and so I asked if its emotional range was the element that made it cross over as a play. “That’s all down to PR, and how you pitch it,” Clayton responds. “The way forward for human beings is to see how similar we all are,” David observes. “All cultures and societies are controlled in a way by the differences between us, and this pushes you toward being tribal, when in fact we are so much more similar than we are different. As Samuel Johnson said, ‘We are all prompted by the same motives, all deceived by the same fallacies, all animated by hope, obstructed by danger, entangled by desire, and seduced by pleasure’.” Precisely. “They’re not normally people who’d be in your circle of friends,” Kat comments. Jorge bursts out laughing and says, “They’re in our circle of friends”. “I think you’re a magnet for them, actually,” I say, laughing. “Remember at our first interview when Pam the Fag Lady walked in just as we sat down?” Pam is a Soho institution, and pops up all throughout the book. It is time to return to the work at hand, and Clay invites me up to watch the rehearsal for a while. It is a genuine treat, and over an hour has passed before I can tear myself away. From shop to blog, from book to play, the story of Dirty White Boy is a fascinating one. “You do not educate a man by telling him what he knew not, but by making him what he was not,” John Ruskin wrote in Munera Pulveris. That is in essence what we had been talking about on that glorious April afternoon, and it is Clay’s genuine gift as a storyteller I think to myself as I leave. I step into the lift, and Captain Picard says, “Door Closing. Lift going down. Warp 5.” I smile to myself because there is something that feels so right about that. Marcus Reeves on GFEST and Screwged!